Met Students Place Third at Startup Weekend Edu! Owen Cuseo and Noah Salem win third place at Startup Weekend Edu, with their idea to engage students with culturally relevant content by bringing astronomy to life through community stargazing nights. Owen Cuseo and Noah Salem, seniors from the Justice Building and E-Center entrepreneurs, took home third place at Startup Weekend Edu this past weekend. 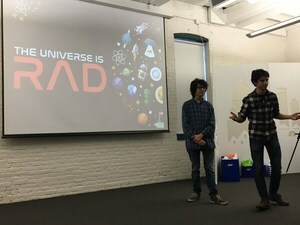 Their startup idea, The Universe is Rad, will be launching its MVP (minimum viable product) this October and was the only student-led project to place in the top three spots. Their prizes include co-working space at the Social Enterprise Greenhouse, a trip to NYC to participate in 4.0 Schools Essentials program, as well plenty of entrepreneurial books and swag. The Universe is Rad will be hosting a community stargazing night featuring telescope observation, virtual reality space exploration, and hands-on science activities designed to engage and inspire the next generation of scientists!